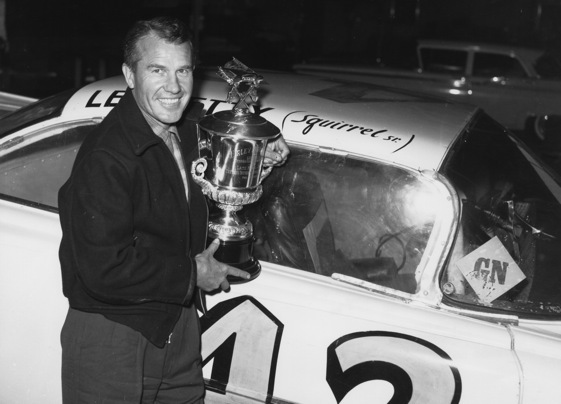 It was early in the morning on June 19, 1949, when Lee Petty pulled out of the dirt drive at his house near the unincorporated town of Level Cross, N.C. His wife Elizabeth rode in the front seat of a Buick borrowed from a neighbor while sons Richard and Maurice rode in the back. None realized at the time they were riding into the eye of history. The race in Charlotte would give Lee Petty a chance to see just how fast he could go. NASCAR founder France was proposing to pay $2,000 from a $5,000 purse to the winning driver of a 200-lap, 150-mile race. His class dubbed Strictly Stock was designed to replace the Modifieds, or street cars from the late 1930’s heavily modified for racing, which had remained popular after World War II during the slow revival of the car industry. The Strictly Stock race attracted would-be racers as well as more established drivers, quite a few of them bootleggers, all angling for the hefty winner’s share. For his part, Lee Petty would come to symbolize the opportunity presented by France’s fledgling sanctioning body for those with the raw talent looking for a better way to make a living. Qualifying earlier in the week had determined the starting order. When race time in Charlotte rolled around after, the main open-air grandstand outside the Charlotte Speedway and the infield were filled to overflowing by fans in shirt sleeves on a warm, sunny day, anxious to see cars just like those in dealer showrooms race on the 3/4-mile dirt track. Police and state troopers had to turn away fans due to overcrowded roads and the lack of space at the dirt oval crudely cut out of farmland in the outskirts of Charlotte. A young Bill France Jr., the future NASCAR president, helped patrol the chain link fence around the perimeter of the track, pulling down those clambering over it after the incoming stream of fans began to overwhelm the rudimentary facility. As many as 15,000 eventually got into the track according to various accounts, most paying $2.50 and $4.00 for tickets and others taking the free route. Maurice Petty recalls that day well, too. Richard and his younger brother watched from a small rise of dirt at the edge of a grandstand that afforded a view of most of the track. “I remember there was a red bank that we stood on where they put dirt up and then put the grandstand on it,” said Maurice. Amidst the noise and excitement, the Petty boys watched the 33 starting drivers and their cars slewing, banging and careening around the dirt oval. There were Lincolns, Oldsmobiles, Fords, Hudsons, two Buicks, two Chryslers, two Kaisers and a lone Mercury from the model years of 1946 through 1949. Some of the drivers were just like Petty and had never been on a track before. The boys kept an eagle eye on their father as best they could from their vantage point as he jostled his Buick through the rambunctious parade. Not long past the halfway point, the boys watched in disbelief when, recalled Richard, their father “turned it over and tore all the doors off it.” The crashed Buick was hauled back to the pits before the race resumed. Driving a 1947 Ford, Glenn Dunaway won by three laps, but was disqualified long after the grandstands had cleared. Dunaway’s Ford had leaf springs in the rear with steel wedges welded into them, a tactic used by bootleggers to keep the suspension stiff under a load of 100 jars of moonshine. Runner-up Jim Roper, who had driven his Lincoln from Kansas, was declared the winner. Fonty Flock, whose brother and fellow whiskey driver Bob Flock led the first 25 laps, was the runner-up and Red Byron was third. “Big Bill” France ultimately came out of Charlotte as the big winner. The NASCAR founder had put together the event in order to head off a similar race for production cars being organized by Bruton Smith and the NSCRA sanctioning body composed of a group of promoters and drivers, who had incorporated before NASCAR but were slow to organize a series. Although Smith, who ran regular Modified shows at the track in Concord, N.C., would combine forces with longtime AAA promoter Sam Nunis to draw an even larger crowd to the hillsides of Lakewood mile to watch a Late Model Stock race later that fall, France had laid the cornerstone for a series of events for the class he dubbed Strictly Stock. Although France beat Smith and the NSCRA to the punch in replacing the Modifieds, neither one was the first to run races for stock cars in the post-World War II era. The International Motor Contest Association had run a Stock Car race near Topeka, Kansas at the state Fairgrounds three weeks prior to the Charlotte event. That sanctioning body’s first race for stock cars had been run two years earlier in 1947. Charlotte race winner Roper, in fact, had been a regular participant in IMCA events in the Midwest in the post-war years aboard a variety of equipment. Despite the crash, Lee Petty remained determined and confident. He went on to win his first NASCAR race in October of that year with a 1949 Plymouth coupe and finished second in the first seven-race Strictly Stock championship to Byron, a veteran competitor driving for the long-established team of Atlanta bootlegger Raymond Parks. Lee Petty’s desire to go racing on dirt ovals in a relatively cheap production car was typical of a phenomena that was repeated across America in the 1940’s and 1950’s. “Everybody,” said Richard Petty, “thought he could out drive somebody.” In the ensuing decades, the racing results posted by the Petty family were far from typical. After Lee scored three NASCAR championships, Richard took over and scored seven more with engines built by younger brother Maurice. For organizer France, the first Strictly Stock race in Charlotte became a crucial step for his NASCAR organization, which had been incorporated less than two years earlier in Daytona Beach. After the introduction of the seven-race Strictly Stock series, the sanctioning body went on to become the most successful motor racing organization in America and one of the most successful in the world. Made up primarily of rule-bending, fender-banging rural and small town white southerners like the Pettys, NASCAR came to be synonomous with stock car racing. But the record confirms that France did not invent racing for cars off the showroom floor with his first seven Strictly Stock races in 1949. Rather France and his partners at NASCAR were the first to build a national organization for stock car racing. Though stock car racing’s bloodlines may have run strongest in the states cleaved by the Appalachians that were home to many a bootlegger – including the mountains north of the Mason-Dixon line – it’s more than the story of one geographic region or those who carried tax-free liquor. Newspapers, newsletters, oral histories and web sites from car clubs and racing associations recount stories from the early days of stock car racing at dirt tracks across the country.